Chanukah is an eight-day festival that, like most other Jewish holidays, has both historic and seasonal origins. It celebrates the victory of the Maccabees over the Hellenistic Syrians in 165 B.C.E. 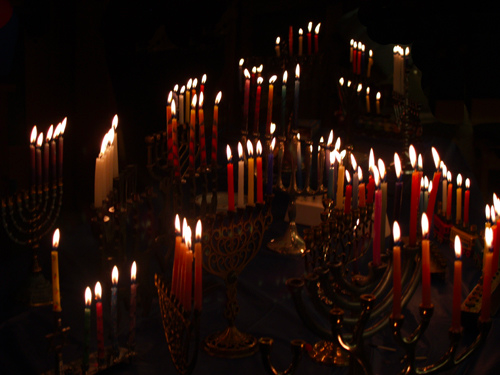 The central motif of Chanukah has always been light: miracle of the oil, the light of the altar, the light everlasting, and eight candles of the menorah. Chanukah is the only important Jewish festival not referred to in the Bible. “We’ve come to chase away the darkness, carrying light and fire in our hands…” goes the modern Israeli song. Hanukkah is a time to celebrate the tiny miracle of oil and light, and the spirit of the Jewish people fighting to preserve our identity throughout the course of history. In addition to lighting Hanukkah candles, the rituals of this holiday can be enriched by innovative Hanukkah practices that celebrate women’s connections to the Hanukkah story, that focus on healing, and that offer an inspired role for gift giving. Hanukkah (alternately spelled Chanukah), meaning “dedication” in Hebrew, refers to the joyous eight-day celebration during which Jews commemorate the victory of the Maccabees over the armies of Syria in 165 B.C.E. and the subsequent liberation and “rededication” of the Temple in Jerusalem. The modern home celebration of Hanukkah centers around the lighting of the hanukkiyah, a special menorah for Hanukkah; foods prepared in oil including latkes (potato pancakes) and sufganiyot (jelly doughnuts); and special songs and games. Chanukah is the Jewish eight-day, wintertime “festival of lights,” celebrated with a nightly menorah lighting, special prayers and fried foods. The Hebrew word Chanukah means “dedication,” and is thus named because it celebrates the rededication of the Holy Temple (as you’ll read below). Also spelled Hanukkah (or variations of that spelling), the Hebrew word is actually pronounced with a guttural, “kh” sound, kha-nu-kah, not tcha-new-kah.